My climbing style has evolved to a cinching anchor for my positioning lanyard, I still use it doubled but majority of the time cinched. 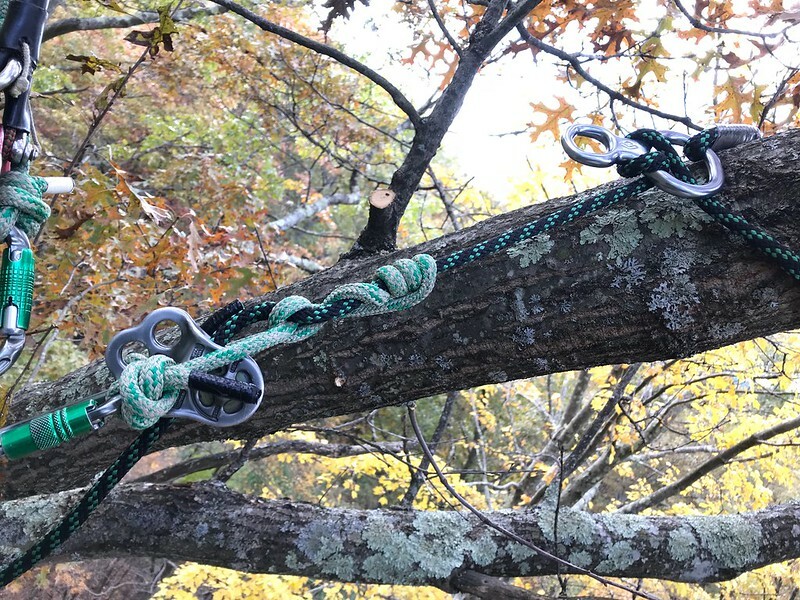 Even on a spar a cinched lanyard can help a climber counter lean when you're running a saw on spurs. I've received enough grief cinching an alloy carabiner I started doing drawings of a device that would allow me to cinch in a way that doesn't violate industry norms. Before I start attempting an expensive process of milling prototypes I decided to test using an F8 sewed to the end of a lanyard. Used it working yesterday, was pretty damn good, not as easy to cinch as a carabiner in certain situations where for example you're holding on with one arm while cinching a lanyard with the free hand, still workable for that scenario. I've done intensive ground testing trying to shake it free when slacked, it doesn't come out. For additional security you can twist and cross the bight over the "horn" but it's more peace of mind than anything else, the bight doesn't come off the horn. A slightly more compact F8 with a round large opening would be best, looking to pick one up, the Black Diamond 8 is one I had laying around, works fine. It can be used doubled mode like this, over a limb to center attachment or around a limb/spar to your side D's. Thinking of refinements so the carabiner doesn't rotate to the gate. Here's a brief video demo, not showing doubled line functionality, just the single/stationary and a simple remote release with tail after the lanyard is slacked. I just used a stopper knot to release it, more reliable to clip into the F8 bight to release it. Very neat and looks quick to use. Love the releasable feature! If you’re looking at fabbing something, what about three holes? Excellent. I'm working on drawings for an optimized device, all ideas welcome. Main thing is keep it simple, quick on/off, secure. Looks like it would be easy to use, even with heavier gloves in cold weather. That’s novel and I think that most lanyards serve just a couple of functions when actually there are loads of potential applications and ways to rig them. 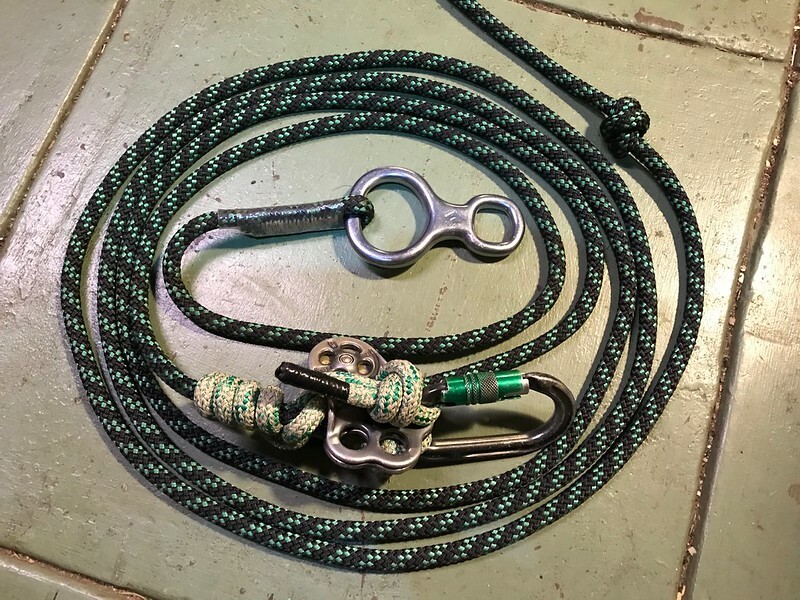 I’ve added a video showing my spur climbing hard/soft hand lanyard with a novel take on the working end. For the cinch setting it can be trapped with a biner or a bight for remote release. Imp is cool, for redirects, too many horns to be on the end of a lanyard. I on occasion will use my lanyard in SRT as well. Most times I am ok with choking a carabiner around the limb, but a quick way to avoid that is to clip it like this. 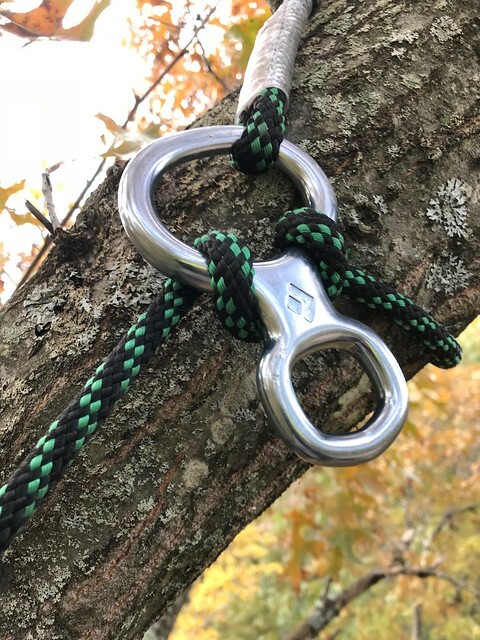 It will not cross load the carabiner, in fact most times there is no weight on the carabiner at all due to the end of the lanyard being pinched into the tree, and it can be remote set and cinched. Some changes to the figure eight would be to make the circle smaller, more d shaped, and replace the small circle with two small horns. 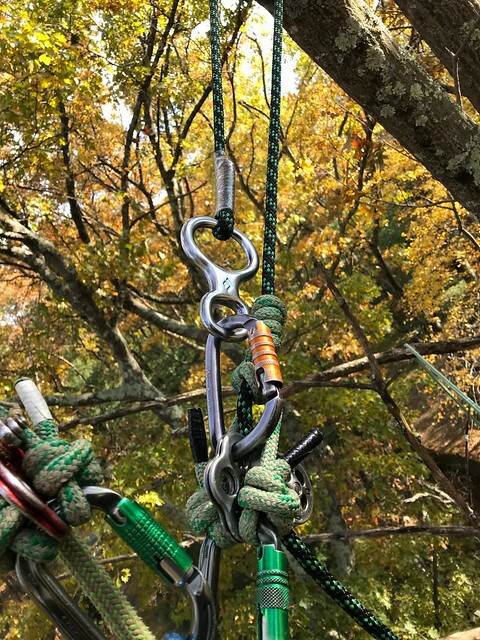 Similar to Paul's method above is to use a carabiner Prusik with only an eye on the end of the rope. I forgot to mention, when remote setting it you do have to flip it a little for it to cinch down. The rope on rope does not slide quite as nicely as a carabiner would. I just tried out something different for choking my lanyard that is easy to do, chokes easier than my last configuration and seems like a great option for not cross loading. Please let me know if I'm putting forces on my lanyard snap that I shouldn't. This also allows for a versatile lanyard setup. Moss, would it be ok to switch out the aluminum carabiner for an oval steel one and continue using as you were?